During Faculty Bulldog Days, it’s the teachers’ turn to learn. They attend classes, complete required reading, and participate in discussions — all the while, soaking in new and different teaching methodologies. It’s an event that began last semester and has grown to include more than 180 faculty members who either opened their classroom, attended other classes, or both. This time around, there were sociologists visiting film studies classes and a physicist sitting in on a women’s, gender and sexuality studies class. There were biologists learning about psychology and anthropologists taking a page from radiology and biomedical imaging. 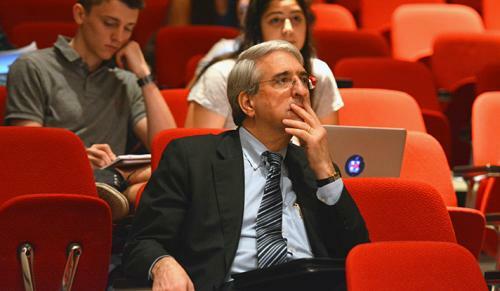 And if anyone needs further proof that innovative teaching is treasured at Yale, they need look no further than President Peter Salovey, who took the opportunity become a student for a day. Salovey’s course selection for Faculty Bulldog Days was a history of art class taught by Jacqueline Jung. The class met at the Yale University Art Gallery; Salovey sat near the front row.